“Run-to-waste” describes those systems where the excess nutrient or “run-off” is not re-circulated. Conventional ‘soil culture’ is a type of run-to-waste system. Media with a high water holding capacity are used (e.g. 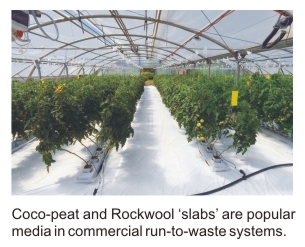 soil, coconut fibre, Rockwool). Feeds are small and infrequent. The ‘run-off’ is either drained directly onto the ground (Fig 1.5a) or is collected (Fig 1.5b & 1.4b). Collecting the run-off allows feed volume and frequency to be calculated more accurately. This helps prevent under-dosing or over-dosing. It also allows the waste nutrient to be disposed of more responsibly. Feed volume and frequency is calculated so that the percentage run-off is typically 10-20% (Table 9.20). Irrespective of whether the nutrient is collected or drained directly onto the ground, plain water flushes are usually needed at frequent intervals through the same plumbing. This helps minimize salt build-up in the root zone and also helps keep the feed circuit free of blockages. System design is similar to satellite systems. Plants are usually seated in pots (Fig 1.4b & 1.5a) or leach trays (Fig 1.5b). ● pH and EC of the nutrient feed solution is stable. ● Plants receive fresh nutrient at each feed. ● The use of media having high water holding capacity minimizes the risk of plant death in the event of nutrient pump failure. ● In the event of root disease outbreak, there is less risk of cross contamination between pots or trays because the nutrient is not recirculated. ● Can be an advantage for higher salinity waters. Unlike recirculating systems, salinity does not build-up in the nutrient solution. ● Intermittent feeding results in salt build-up at the root zone and the blockage of drippers. However, this can be minimized by periodic flushing with water. ● Unlike recirculating systems, it can be difficult to control the nutrient’s EC at the root zone. ● High water holding capacity media are prone to water-logging and therefore waterings must be carefully controlled. This can be especially difficult when air temperatures fluctuate greatly. Over-dosing causes water-logging, disease and wasted nutrient. 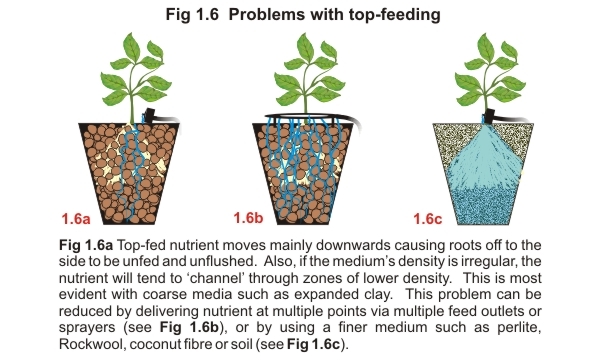 ● Top-fed nutrient tends to channel downward through the medium where root density is lowest (Fig 1.6). ● In commercial systems this practice is rapidly being outlawed because the discarding of ‘run-off’ causes contamination of groundwater.